Cloudy skies early, then partly cloudy after midnight. Low 37F. Winds SSW at 10 to 15 mph..
Cloudy skies early, then partly cloudy after midnight. Low 37F. Winds SSW at 10 to 15 mph. 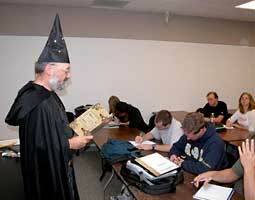 FROSTBURG, Maryland (AP) - Harry Potter is in college — as a subject, not a student. "The Science of Harry Potter," a three-credit honors seminar new this fall at Frostburg State University, offers fans of J.K. Rowling's popular fantasy novels an opportunity to study the links between magic and science. Can antigravity research produce a flying broomstick? Can Fluffy, the three-headed dog, be explained by genetic engineering? Those are some of the questions physics professor George R. Plitnik is exploring with 15 students, mostly juniors and seniors. He says the class is not all fun and games, despite his penchant for dressing up as Albus Dumbledore, headmaster of Hogwarts School of Witchcraft and Wizardry. "This is not something where you just show up and talk about Harry Potter books and get a grade," Plitnik said before donning his black wizard's hat and robe for a recent session. "This is a college-level class." Frostburg State, a public school in western Maryland with average annual undergraduate enrollment of 4,300, isn't the only institution of higher education offering a scholarly take on the Potter phenomenon. The books were featured in a "Literature for Young Adults" course at Kent State University in Ohio, and Cerritos College, in Norwalk, California, has an introductory composition class, "Words and Magic: Harry Potter and Vocabulary," this fall. Plitnik's seminar may be the first science-based Harry Potter class offered for college credit, although other schools, including Penn State University, have developed similar programs for children's summer camps. Plitnik designed his course after reading "The Science of Harry Potter: How Magic Really Works," by London-based science writer Roger Highfield. The book, published last year, uses Rowling's fanciful creations as springboards for what The New York Times Book Review called "an enjoyably indirect survey of modern science." In the book, one of two required texts in Plitnik's class, Highfield discusses Muggle (ordinary human) technology capable of approximating such magical effects as walking through walls and regrowing bones. He covers the latest research on teleportation — "apparating" in the Potter books — and devotes an entire chapter to Bertie Bott's Every Flavor Beans and the science of taste. Plitnik's students must do similar research for their final project, a written and oral presentation on a scientific topic with a Harry Potter theme. It accounts for a fifth of their grade. Other grading factors include two written exams and daily quizzes on assigned reading in the Highfield book and in a collection of critical essays, "Reading Harry Potter," edited by Giselle Liza Anatol, an assistant professor of English at the University of Kansas. They are not required to have read all five Potter books. Four of the 14 students at one recent session acknowledged having done so, although all had read at least one or seen one of the two Harry Potter movies. The class is geared toward nonscience majors; there is no laboratory work. Still, the workload is heavier than Jackie Boehm, an English major, expected when she signed up for what she assumed would be a blow-off class. "I was like, 'Wow, we actually have to read books,'" she said. Plitnik tempers the serious approach with sometimes zany teaching methods. The bearded, 61-year-old acoustics expert is renowned on campus for his costumes, props (a rubber chicken is never far away) and other gimmicks. Last year, he invited a Brazilian colleague, Leonardo Fuks, to lecture one of his classes and lead them in a bicycle-riding musical performance. "I get bored doing the same thing," Plitnik said. He said he had read most of the Potter books for pleasure before conceiving of the class. They are lighter fare than the nonfiction he usually reads, but Plitnik said they made a good hook for a class. "If I had a seminar and said, 'We're going to talk about the science of airplanes flying,' you'd have one student sign up." Michael Dorsey, a junior, is taking his second Plitnik-led class. "I think he takes it very seriously," Dorsey said. "He's real energetic and seems to know what he's talking about." Last year, the University System of Maryland recognized Plitnik with an award for excellence in research, scholarship and creative activity. With Plitnik in charge, Frostburg State President Catherine R. Gira said she isn't worried that some may view a Harry Potter class as trivial. "Irrespective of the specific title of the course, the 'magic' in the fiction is being analyzed by applying concepts of physics, chemistry, biology and engineering. This honors course creatively packages scientific principles in a contemporary way that will interest today's students," Gira said. Wow! They are looking very much exited like me to know the science of Harry Potter. You can visit www.top5writingservices.com/edubirdie-com-reviews website to get writing level to make beautiful presentation. I like the way that they structured the whole class in the taste of Harry Potter so by that they can understand more easily. Anyways thanks David for sharing this article.